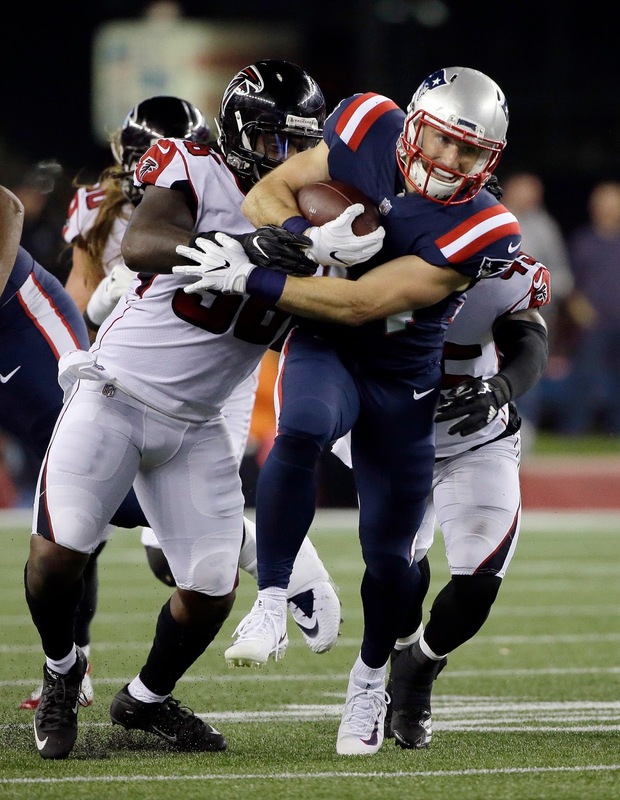 After missing Weeks 3 through 6 with a persistent rib injury, Rex Burkhead seemed to have fallen out of the Patriots' running back rotation. With early-down bulldozer Mike Gillislee and the untouchable Dion Lewis, not to mention passing back James White, ahead of him on the depth chart, Burkhead looked like the odd man out in only his first year in Foxborough. Put bluntly, the former Cincinnati Bengal laid those fears firmly to rest on Sunday night. Burkhead was effective on the ground, carving up the Falcons for 31 yards on only six carries, and he tacked on 11 yards through the air to boot. While it was clear the team was trying to ease him back into game action--he played a mere 13 snaps, tied with Mike Gillislee for least among running backs--he was among the most effective when on the field and showed no signs of rust after his long absence. With the Pats finally looking like the dominant team they were expected to be going into the season, Burkhead's return couldn't have come at a better time. After his impressive return performance he should be solidly established in Bill Belichick's committee gameplan. And while he might not get as many snaps there as White or even Lewis on a week-to-week basis, he should be able to rival Gillislee and add some value on special teams as well. If he keeps playing like he did against Atlanta in more extended time, it's not hard to imagine him becoming one of the team's most versatile weapons on offense--and one of its most valuable contributors in high-leverage situations.